For the past three weeks, my family and I have been on the GAPS introduction diet. If you’re not familiar with the GAPS diet, it’s purpose is to heal and seal the gut lining to alleviate symptoms like GI upset, food allergies, eczema, behavioral challenges, and more. I had seen some symptoms that made me think GAPS was the next step we should take in our whole food journey, and so far, we’re seeing encouraging signs that it’s helping! I’m sure I’ll share more about our GAPS experience in the future but, to be honest, I’m spending so much time in the kitchen, I can barely keep up with feeding us and getting our laundry done, much less sitting down and thinking about something for more than a few minutes! What does all of that have to do with Mexican Chicken soup? Everything! The GAPS intro diet is very (very) restrictive in the beginning – basically meat stocks, meats, and boiled vegetables. For a family who loves eating colorful, healthful, and delicious food, those first stages were a doozy! So, when our intro diet advanced to allow a few additions like avocado (gasp! ), creme fraiche, spices, and fresh herbs (cue angel’s singing), I finally felt like I could add the flavor and texture we’d been missing so much. And, lo and behold, this soup tasted like something we would have eaten before starting the diet! Chicken Caldo is actually one of the things I order most when we eat at our favorite Tex Mex restaurant. It’s made with homemade chicken stock (or broth), shredded chicken, and vegetables, so it’s healthy and super comforting in the winter time. 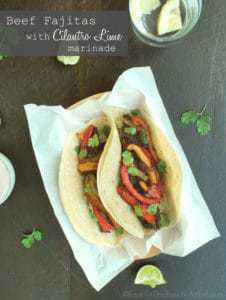 The flavor of this recipe was surprisingly close to the flavor of the one I order at our favorite Tex Mex restaurant. If you’re a purist, you can forego the creme fraiche – but I love the creamy contrast to the cilantro and warm Mexican spices. I chose creme fraiche because it’s a cultured cream (with probiotics), but you can substitute sour cream if that’s more familiar to you. 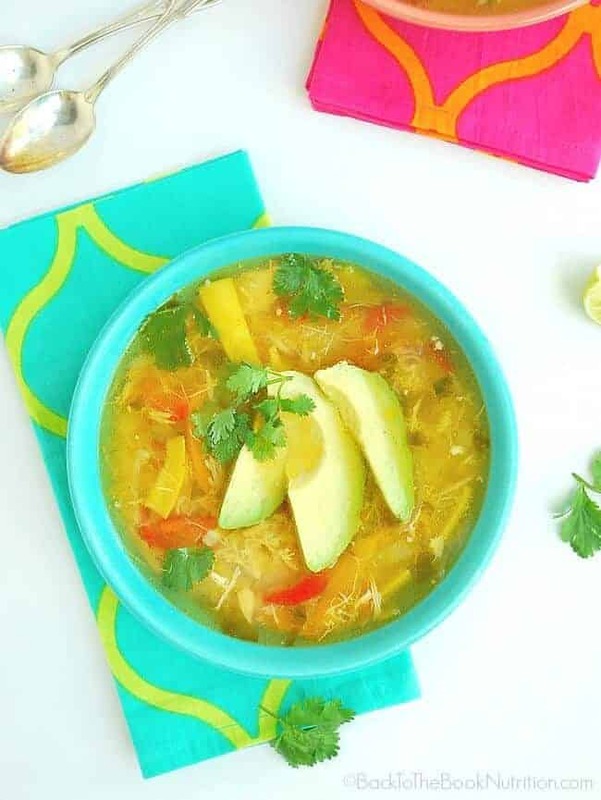 Usually caldo includes white rice along with the broth, chicken, and vegetables – if you’re not eating grain free, feel free to add some cooked white rice at the end. You could probably even add uncooked white rice during the last 10-15 minutes of cooking like I do in my 20 Minute Rotisserie Chicken & Rice Soup and just let the simmering stock cook it for you. Any way you serve it, this simple and comforting caldo makes a nice light dinner for 4, or soup course for 6-8! * I use the whole chicken, water, and some vegetables to make a pot of chicken stock (Click here for a basic stock recipe similar to what I make! ), Once the stock is done, I remove the whole cooked chicken from the pot using two pair of tongs, discard skin, reserve the bones for making bone broth later, and shred the meat. I strain the stock through a fine mesh strainer, then use it as a base for this soup. Heat ghee, stock, onions, bell peppers, and garlic in a stock pot until it reaches a boil. Reduce to a simmer, cover and cook until vegetables are al dente (about 5 min). Add shredded chicken, tomato, squash, all purpose seasoning, cumin, 3 Tbsp cilantro, and sea salt. Cover and cook until all vegetables are very soft (5-10 min). Squeeze juice from the lime into the pot and give it all a good stir. Add additional sea salt if needed. 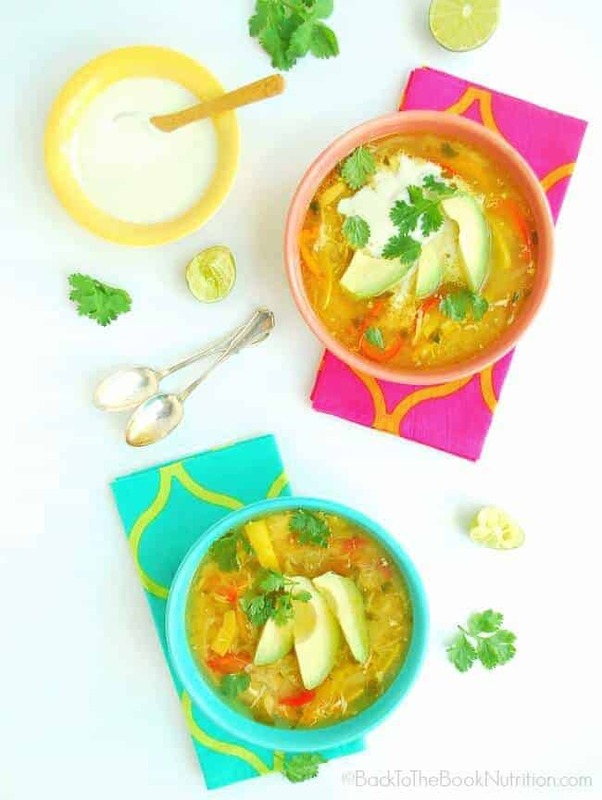 Ladle into bowls and garnish with fresh cilantro, avocado slices, and sour cream/creme fraiche. Check out these other Tex Mex favorites!